Crystal Light Focus is a powdered drink mix made by Kraft. Focus contains caffeine, zinc, vitamin E, magnesium, and potassium as its active ingredients. Each sachet of Crystal Light Focus is to be mixed with up to 16.9 fl. oz. of water. Citric Acid, Maltodextin, Aspartame, Caffeine, Contains less than 2% of Natural Flavor, Zinc Gluconate, Vitamin E Acetate, Magnesium Oxide, Sodium and Potassium Bicarbonate, Calcium Carbonate, Soy Lecithin, Bha (to Help Protect Flavor), Artificial Color, Yellow 6, Yellow 5. Contains: Soy. 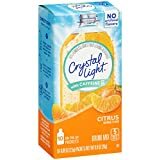 Crystal Light Focus contains 2.50 mgs of caffeine per fluid ounce (8.45mg/100 ml).